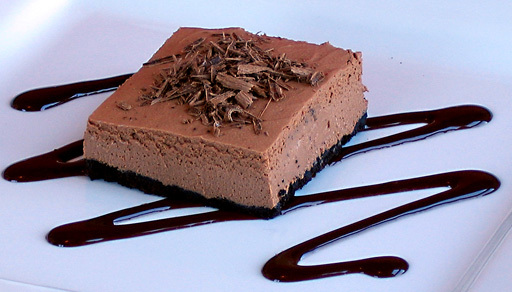 Easy Gourmet Recipes - Chocolate Cheesecake Squares Recipe. Healthy natural recipes including breakfast recipes, appetizer recipes, soup recipes, pasta recipes, holiday recipes, party recipes, dessert recipes, gluten-free recipes, raw recipes and budget recipes. The decadently delicious flavor of chocolate cheesecake take a casual turn when baked in a pan and cut into squares. Garnish with your choice of fresh berries, toasted nuts, or chocolate curls, or top the squares with broken pretzel pieces and a drizzle of balsamic glaze. Variation: Use a 7 or 8-inch springform pan to make a traditional-looking cheesecake. This recipe is from Quick-Fix Vegan by Robin Robertson � 2011. Used with permission. Thanks so much to Robin Robertson for sharing this fabulous vegan cheesecake recipe with the Yummy Plants community! Robin Robertson has worked with food for more than twenty-five years as a restaurant chef, cooking teacher, and food writer. A longtime vegan, Robin is the author of numerous cookbooks, including the best-selling Vegan Planet, 1,000 Vegan Recipes, Vegan Fire and Spice, and Vegan on the Cheap. Her latest book is Quick-Fix Vegan. Robin writes the Global Vegan column for VegNews Magazine and has also written for Vegetarian Times and Cooking Light, among others. Visit her Global Vegan Kitchen website. You can keep up to date with Robin on her blog. She can also be found on Facebook and Twitter. 1. Preheat oven to 350F. Grease an 8 inch-square baking pan and set aside. 2. In a bowl, combine the cookie crumbs, the 2 tablespoons sugar, and vegan butter and mix to moisten the crumbs. Press the crumb mixture into the prepared baking pan and bake for 5 minutes. Set aside. 3. In a food processor, combine the cream cheese, the 3/4 cup sugar, melted chocolate, and vanilla and process until smooth. Spread the mixture onto the crust. Bake until firm, 20 to 25 minutes. 4. Cool to room temperature then refrigerate until chilled. To serve, cut into squares and garnish with chopped nuts, berries and chocolate curls.